Blog ICBC Woes: Is a Bee in My Car an “Emergency Situation”? ICBC Woes: Is a Bee in My Car an “Emergency Situation”? Now that the summer weather is upon us, a question on every driver’s lips is “if a bee flies into my car, am I still required to control my car?” The short answer is yes. 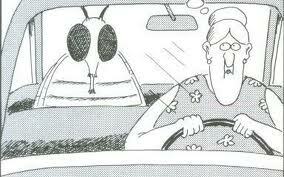 A live bee in your vehicle does not constitute “an emergency situation” – you must remain calm. Need an ICBC claims lawyer? Call us.